Knollwood Village in Southern Pines is an established 55+ golf course community near the Pinehurst, North Carolina area. Residents spend their free time on 9 holes of golf situated on two walkable courses. If golf isn t your main interest, homebuyers are pleased to know that they have access to a clubhouse and its amenities just down the road. Knollwood Village residents enjoy a low monthly homeowners association (HOA) fee that gives them the opportunity to lock and leave as they please. Getting to savor the great outdoors is never hard while living in Knollwood Village. The community provides an outdoor pool, wooded walking trails, and scenic ponds spread throughout the neighborhood. Golf enthusiasts will be pleased to know that this active lifestyle community is situated around the Knollwood Fairways & Driving Range. This 9-hole course is complete with 22 acres of practice facilities that include an all-grass practice tee, driving range, and chipping and pitching area. Professional services include lessons and club fittings that won PING Golf s "National Club Fitter of The Year" in 2010. Residents of Knollwood Village are offered memberships to Midland Country Club, located just two miles west on Midland Road. At Midland Country Club there is a 12,000 square-foot clubhouse complete with a meeting and activity center, exercise room, and library. After a round on the 9-hole course you can meet your friends in the full-service restaurant, Table on The Green, cool off at the second outdoor pool, or purchase new equipment in the pro shop. The community is complete with 240 condos and townhomes that have low-maintenance exteriors, single-level living, and affordable prices in a golf course setting. Homebuyers can also find a few single-family homes within the community. Condos were built throughout the 1960s and 1970s. They range from studios to two-bedroom units with one bathroom and outdoor parking in a lot. Most condo units range in size from approximately 560 to over 1,000 square feet. After the condos, townhomes were built in the1970s to 1980s with a few constructed in the late 1990s and early 2000. Typically, these attached ranch homes have two to three bedrooms, two bathrooms, and a carport or attached garage. Townhome residences in Knollwood Village have about 1,450 to over 1,900 square feet of living space within a single-story floor plan. Golf fanatics are right at home in Knollwood Village. There are numerous golf clubs and lessons provided by professionals. Non-golf activities can be found throughout the Midland Country Club clubhouse s activity rooms and library where residents can meet for parties and club meetings. Living in a maintenance-free home with an established HOA lets residents of Knollwood Village live a carefree lifestyle with more time on their hands to do as they please. Knollwood Village is located in Southern Pines, North Carolina. Situated in Moore County, residents are never far from daily necessities or recreational activities. Mill Creek Village, located less than three miles away, is a retail center that has a Harris Teeter grocery store and pharmacy. The Pinehurst area offers some of the best golf in North Carolina with 40 world-class courses within a 15-mile radius. Golf Digest ranked Pinehurst as the number four Best Buddies Trip Destination in 2013. With numerous lakes for fishing and boating as well as lush park areas, residents can easily enjoy the area's comfortable year-round climate. Other popular attractions throughout the Pinehurst area include the Airborne & Special Operations Museum, Black Rock Winery, Carolina Horse Park, Carthage Museum, and the North Carolina Literary Hall of Fame. Knollwood Village is a great community for homebuyers looking for resale homes in Southern Pines, North Carolina. Knollwood Village is situated along the Knollwood Fairways at 1470 Midland Road in Southern Pines. Located at 2205 Midland Road in Pinehurst, Midland Country Club is the sister course to Knollwood Fairways and offers memberships to those living in Knollwood Village. Check back soon for more information on the lifestyle in Knollwood Village. 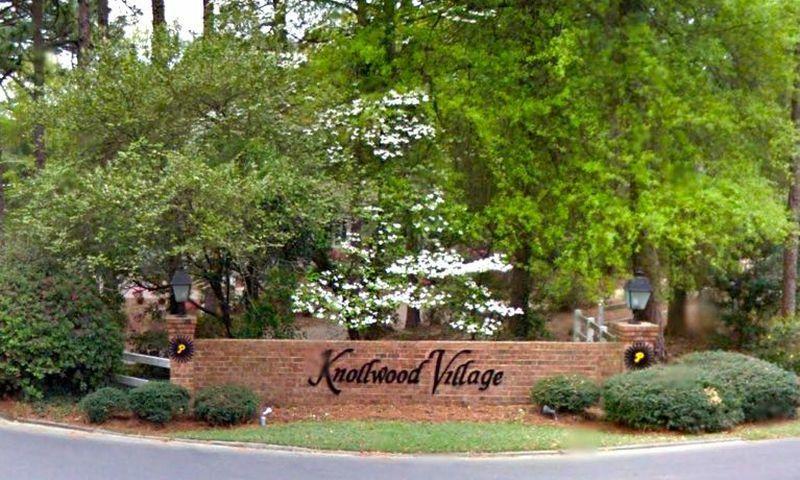 Knollwood Village condos were built during the 1960s and 1970s. They range in size from studios to two-bedroom units with one bathroom. Units offer between 560 to just over 1,000 square feet of living space with plenty of parking available in a lot. Please Note: Due to the age of this community, not all floor plans are available. Most of these attached homes were built from the 1970s to 1980s with a few in the late 1990s and early 2000. The townhomes within Knollwood Village come with either a carport or attached garage. These ranch floor plans range in size from approximately 1,450 to 1,980 square feet with two to three bedrooms and two bathrooms. Please Note: Due to the age of this community, not all floor plans are available. Although Knollwood Village is mostly comprised of condos and attached homes, there are single-family homes as well. These detached residences typically offer just under 2,000 square feet of living space with two to three bedrooms, two to three bathrooms, and an attached garage. These are a great low-maintenance option with a bit more privacy. Please Note: Please Note: Due to the age of this community, single-family home floor plans are available. This community is nice and wooded. The community as a lot of nice ranch homes and is close to downtown Southern Pines. 55places.com is not affiliated with the developer(s) or homeowners association of Knollwood Village. The information you submit is distributed to a 55places.com Partner Agent, who is a licensed real estate agent. The information regarding Knollwood Village has not been verified or approved by the developer or homeowners association. Please verify all information prior to purchasing. 55places.com is not responsible for any errors regarding the information displayed on this website.